We had such a great year of growing basil. I planted 128 plants in our little green room at the farm (which you can see here) and they all grew so well. 128 plants are a lot, if you are just growing for your family, even if you have a large family, a few plants will do. I plant so many because I sell it at the market. Basil is very easy to grow… It doesn’t require any special soil or conditions, it just needs heat and water. The seeds germinated quickly and after a few weeks, I transferred the little plants to the garden. Within a few days, they took off and grew very fast. You’ll plant basil right at the same time you transplant your tomatoes; when the soil has warmed and spring gives wat to summer. Give it a lot of water and watch it grow, I never had a pest bothering my basil so I could easily keep it organic. If you want your basil to grow a bit longer, make sure to pinch the flowers off when they form. 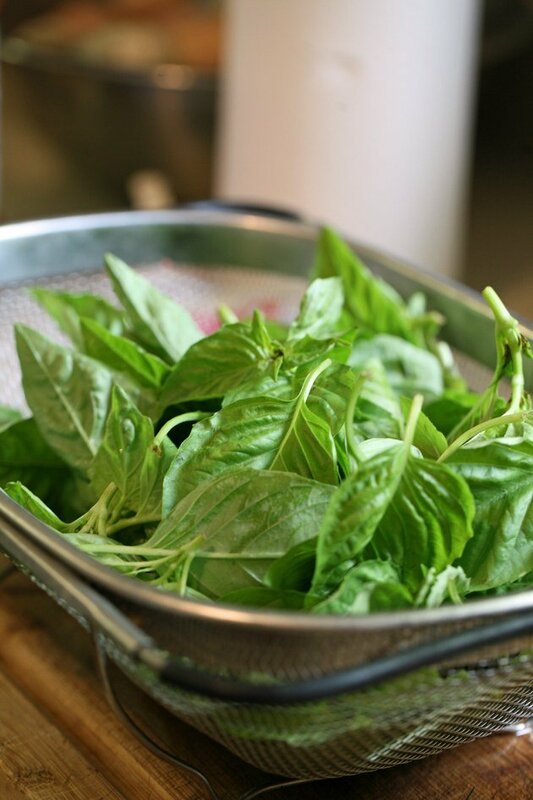 We eat some of the basil fresh in salads, with pasta, or on top of pizza or use it to season dishes, I dry some of the basil for winter use and with the rest, I’m making pesto and freezing it which is such an easy way to preserve it. 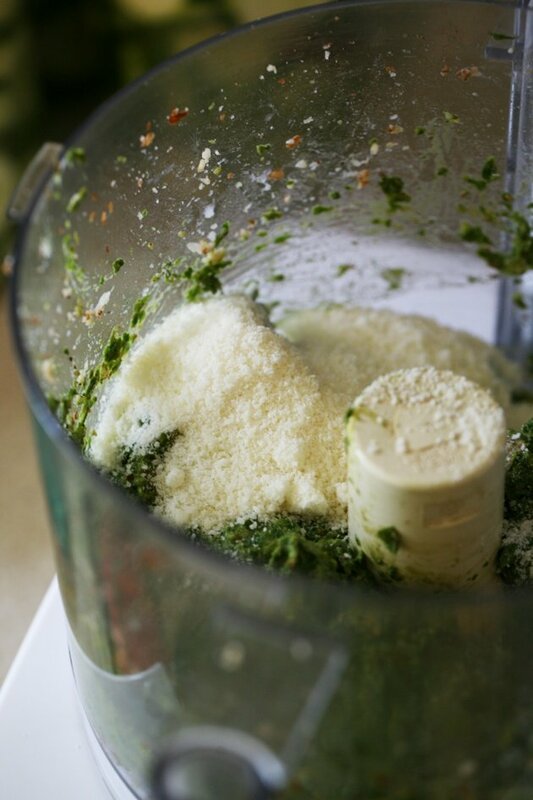 Pesto is so healthy for you… All these fresh greens and raw garlic. Parmesan cheese and olive oil and nuts. 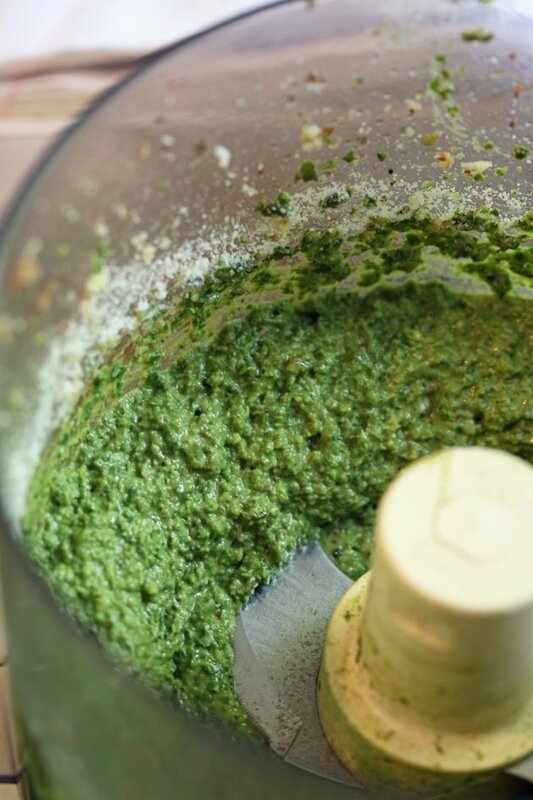 Everything in pesto is healthy for you and what I like most about it is that you can easily make a whole lot of it and freeze it for a long time. 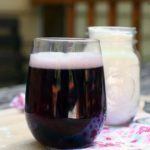 Basil is anti-inflammatory and can protect against arthritis (it is one of the essential oils I mentioned in my post about essential oils that will help support healthy bones and joints). It’s anti-bacterial and is rich in antioxidant. 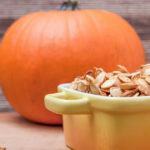 It supports healthy metabolism and is very good for your liver. 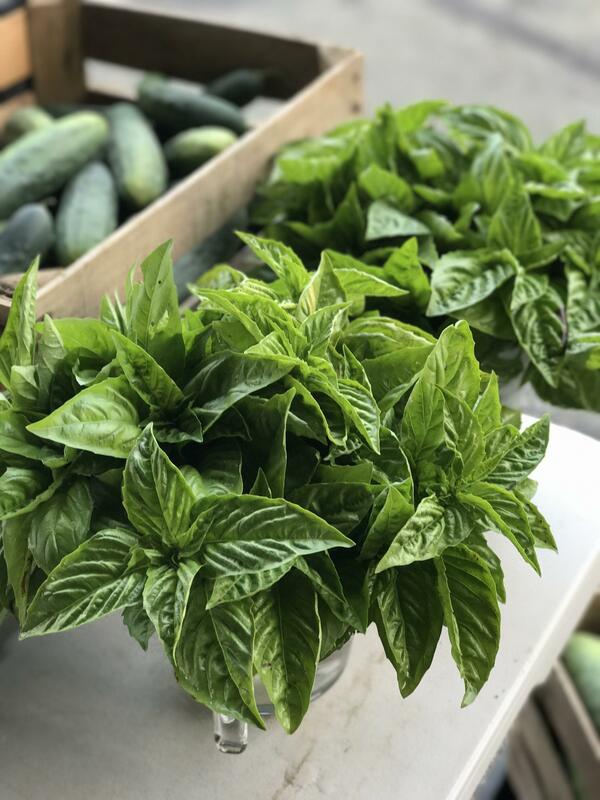 Basil has a million other health benefits, I won’t list all of them here, but what I am trying to say is that it’s very healthy, so easy to grow, very easy to preserve, and so very tasty. So you see, you should grow basil. Even if you don’t have a large garden, basil will do great in a pot on the front porch. Start by harvesting a big bunch of basil leaves. 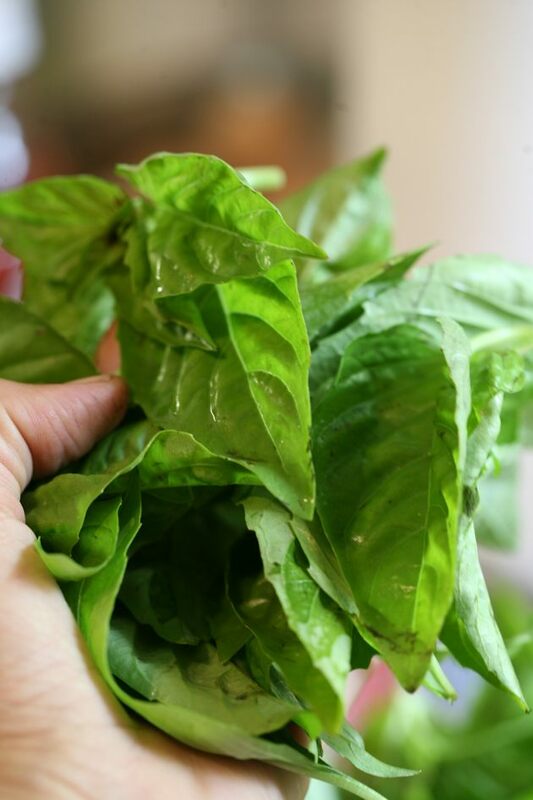 The way to harvest basil is to cut 2/3 of the stem right above a pair of leaves. So you make sure there is 1/3 of the plant still standing and if you cut right above a pair of leaves, your basil will grow back very quickly. Take those stems and remove the leaves from them. I just want to note here that if you harvested your basil but you can’t make pesto right away, store your basil stems in a vase with water on the counter, just like a bouquet of flowers. Don’t put your basil in the fridge; it does not like the cold (will turn brown). The right way to wash any greens from soil is to fill a large bowl with cold water and let the leaves soak for a few minutes. Move them around a few times and then let them be for a few more minutes, the soil will sink to the bottom of the bowl. Then, transfer them to a colander to dry. We want the leaves to be rather dry when we use them to make pesto so you can either leave them on a towel on the counter to dry for a while, or you can use a salad spinner to dry them, or you can put them in a towel and go outside and spin the towel fast in the air (I do this all the time, here is how to do it). 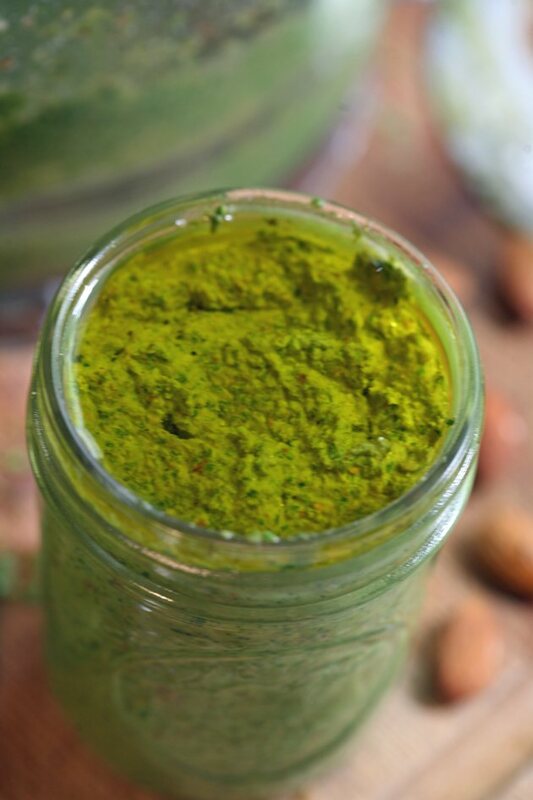 Traditionally, basil pesto is done with pine nuts, but to keep cost down I use almonds instead. You almost can’t tell the difference and they cost 1/3 of what pine nuts cost. 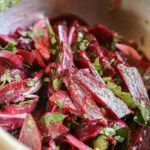 You can use roasted almonds or raw almonds, with or without the peel, and if you don’t like almonds you can also use walnuts. Then, add your dry pesto leaves (I fill the processor to the top but don’t pack it too much) and turn the processor on again. 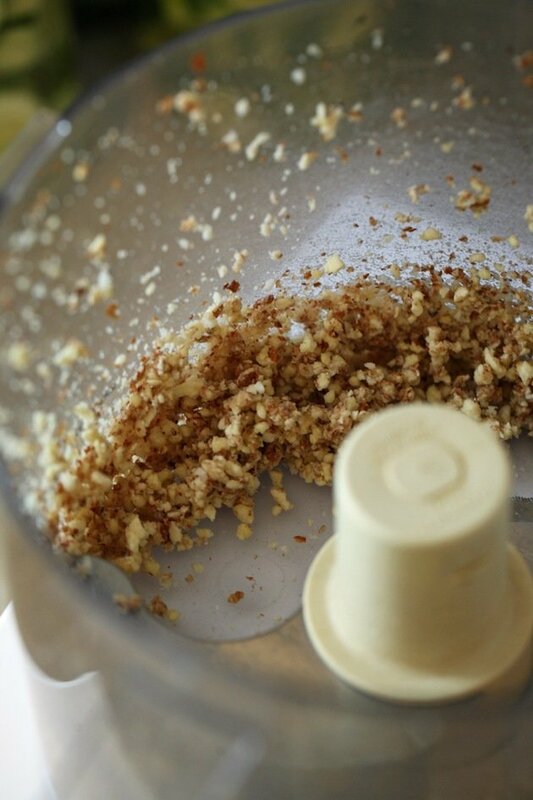 While the food processor is working, add olive oil until you get a paste that has the consistency you like. I like my pesto thick, some people like it runnier, it’s up to you. Turn your processor on one last time and while it’s working add some more olive oil if you want to bring it to the right consistency. And I usually top it with a bit of olive oil, this helps a bit with oxidation. The reason pesto turns brown is a chemical reaction of the cut basil with the air; it’s called oxidation (same thing that happens with guacamole) and if you want to prevent it you can blanch your basil leaves before starting to make the pesto (soak them in boiling water for a minute). Personally, it doesn’t bother me so I usually skip this step. From here, you can either freeze the jar or store it in the fridge and use it right away. You can use this process to make all kinds of pastes. 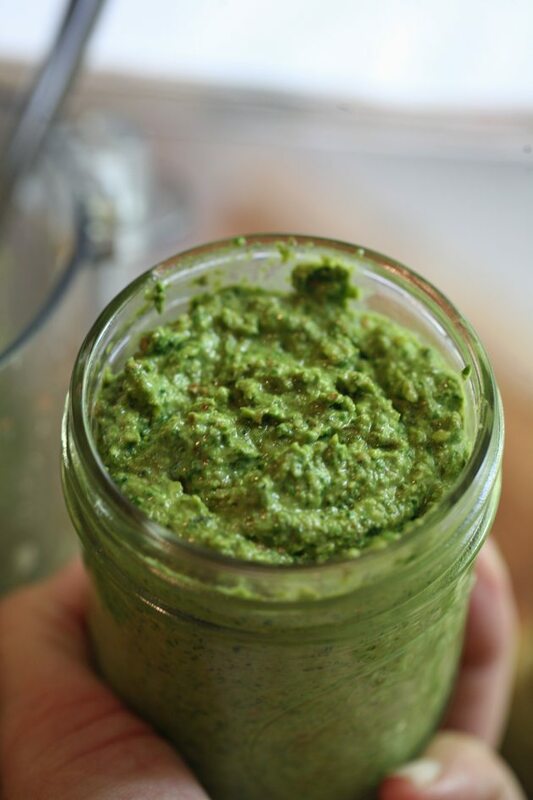 If you have a lot of parsley in your garden, make parsley pesto. 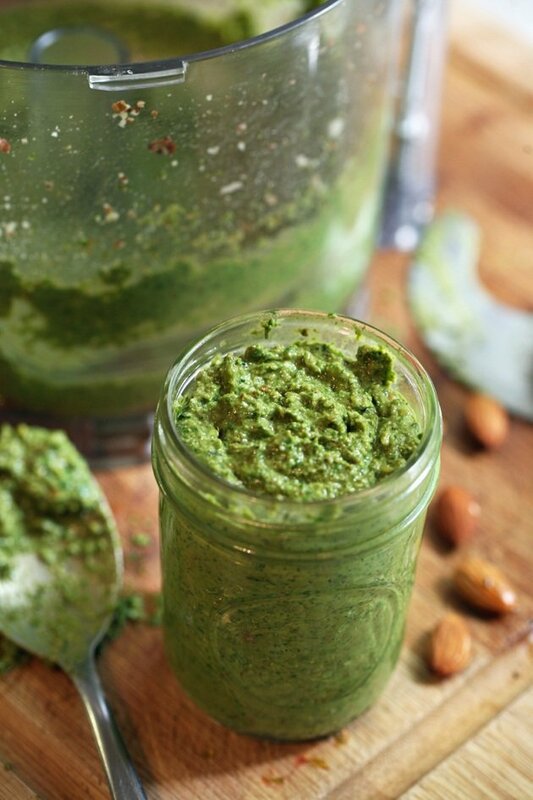 If you have a lot of cilantro in your garden, make cilantro pesto. 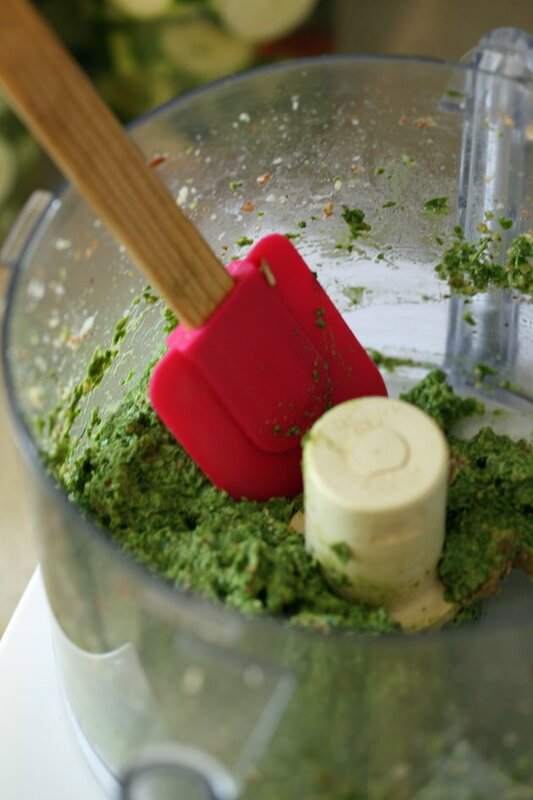 It will be interesting to try chard or kale… I even made pesto with carrot tops! This came out really good. You can read about it here. We use basil pesto for anything Italian. I might add it to a white pasta sauce, or I’ll make pesto pizza. You spread it on the pizza dough instead of tomato sauce and add some goat cheese or feta on top. Bake it and when it comes out add tomatoes, dry or fresh. It’s so good! 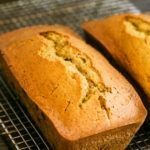 Of course, you can simply spread it on bread (preferably homemade! ), add a tomato and you have an awesome, healthy breakfast. Do you grow basil? Do you make pesto? Do you make it the same way I do? 1. 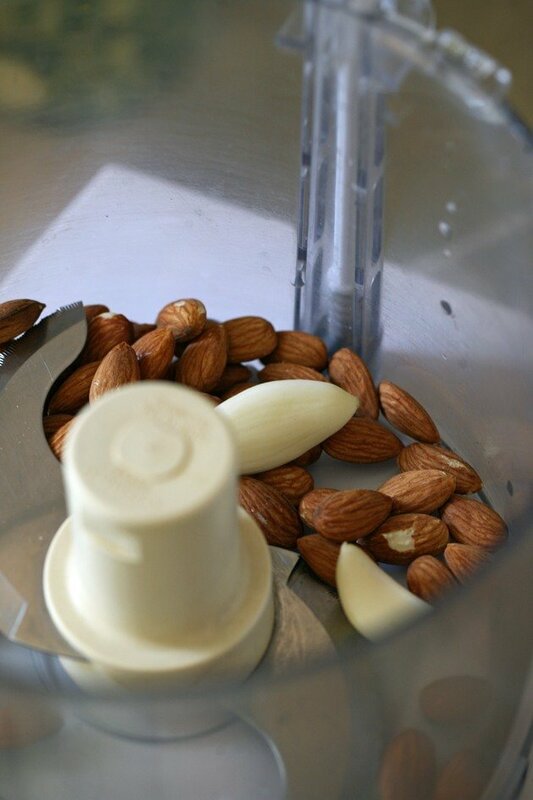 Add almonds and garlic to a food processor and process for a minute. 3. While the processor is working, add olive oil until the paste reaches your desired consistency. 4. Stop the food processor and add the cheese, salt, and pepper. 5. Turn the food processor on again and add some more olive oil if you like. 6. Taste and correct salt and pepper if needed. Freeze or store in the fridge and eat fresh. I grow basil to dry and to make pesto. I will try the almonds instead of pine nuts! Never thought to try that! Thanks for the tip! 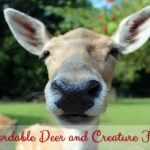 You are welcome, it will save you a lot of money. Yes, I make it the same way you do. I just add a bit of fresh lemonjuice for a “fresh” taste. It is great in winter to taste summer again. Just as a side note; one year I used compost from a local brewery for the basil and was able to fill my freezer with pesto from the three bushes. Yes, anything. 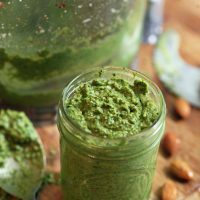 You can make parsley pesto, cilantro pesto, chard pesto… I even have here on the site carrot top pesto recipe made from the greens of the pesto. It came out so good! Basil growing great even in poor soil as long as it has plenty of sunshine and water. I can imagine what will happen with a bit of compost.